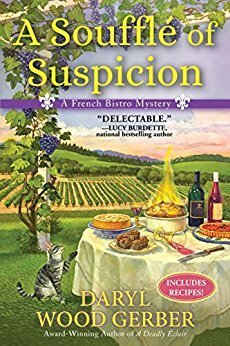 Fans of JoAnna Carl and Joanne Fluke will want a succulent second serving of A Soufflé of Suspicion, Daryl Wood Gerber’s appetizing second French Bistro mystery. A Soufflé of Suspicion by Daryl Wood Gerber is the second book in the cozy A French Bistro Mystery series. As the title and cover may indicate this series is one that is perfect for the foodies to dive into with all the delicious treats and eats hiding between the pages. And if the mouth watering food during the read isn’t quite enough to satisfy there are also recipes included at the end of the book for readers to try some of the foods out on their own. Mimi Rousseau is our leading lady in the French Bistro series with the first book introducing her to readers as she had just lost her husband. Mimi’s dream had always been to open her own bistro and she had taken the tough route getting there by learning the ropes holding various jobs in the food industry. Once her husband had passed she had found herself in debt so she sold everything to clear the debt and then returned home to Nouvelle Vie in Napa Valley where she found a backer to open her own bistro. Now as Mimi has settled into her new life and things seem to be going well for her she’s decided to tackle the Sweet Treats Festival during Crush Week in Nouvelle Vie. But before Mimi knows it she finds herself smack dab in the middle of another murder investigation when Chef Camille’s sister Renee is found dead. Renee had been managing the festival and really wasn’t winning everyone over with her demanding ways so the list of suspects is a mile long but Mimi is determined to find the killer. Having read the first book in this series and liking it well enough I was hoping to dive into this one and find myself loving it even more. However, this time around I just found this one to be missing a bit of that quirky spark that I love so much in stories like this. The story and characters are likable enough but it didn’t really jump out and grab me as much this time around either although the foodie in me enjoys hearing of Mimi’s creations and I do enjoy the lovely setting this series takes place in. So in the end I just found this one to be an OK addition to the series. Agatha Award-winning and nationally bestselling author DARYL WOOD GERBER crosses genres again with her second stand-alone suspense thriller, DAY OF SECRETS. Daryl also writes the bestselling COOKBOOK NOOK MYSTERIES and will soon debut the new FRENCH BISTRO MYSTERIES. As Avery Aames, she pens the bestselling CHEESE SHOP MYSTERIES. Little known fact: Daryl has jumped out of a perfectly good airplane, and she has hitchhiked around Ireland by herself. Fun tidbit: as an actress, Daryl appeared in “Murder, She Wrote.” She loves to read, cook, and golf. She has a frisky Goldendoodle named Sparky who keeps her in line! Good review. A basic cozy! Just got this thru a cozy mystery group I belong to. Will read in early July. Thanks… probably around the 4th of July I’ll read / review. Wonderful review Carrie. Sorry this was just okay for you. The sophomore jinx. I find the second book in a series is often a bit disappointing, then the third is amazing again. Go figure.